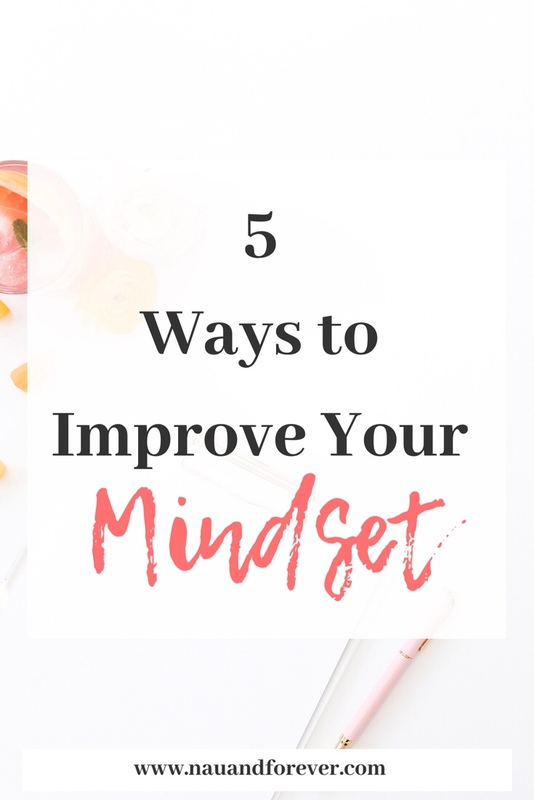 5 ways to improve your mindset! There’s a good chance that you’ve heard people using the term “mindset”. “You need to fix your mindset.” “You have a fixed mindset.” But do you really know what they are talking about? The dictionary defines mindset as “the established set of attitudes held by someone.” Our mindset or our attitudes determines how we react to things that happen in our lives. It’s our way of thinking. When I began working with a life coach, I gained so much insight on this topic. I learned that we have beliefs that we’ve had since we were kids and these beliefs can hold us back as adults. Your mindset can keep your from living a truly happy life. Here’s some great news though! YOU CAN CHANGE YOUR MINDSET! Now, as a LIFE COACH myself, I love helping other women learn these same tricks and change their own lives! 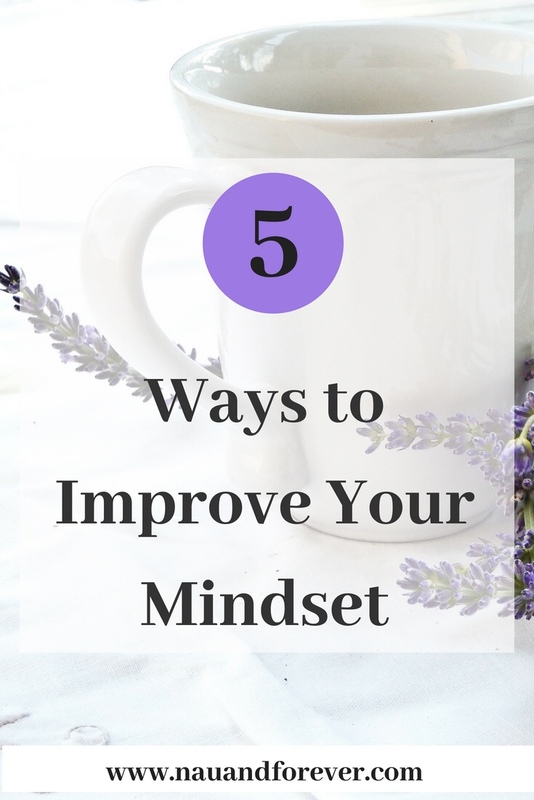 Check out these five ways to start improving your mindset! It’s important that you recognize your “fixed” mindset voice and respond to it with your “growth” mindset voice when you are wanting to improve your mindset. This self-talk is so important! Fixed: “I’m not going to bother trying. I can’t do it.” Growth: “If I don’t try it, then I already failed.” It’s not going to be simple, but you have to start changing the way you talk to yourself. Setting manageable goals is a great step to take when your goal is to improve your mindset. Set small goals. Once you accomplish those, set more goals. Don’t overwhelm yourself, but don’t sell yourself short either. Setting SMART (specific, measurable, achievable, relevant, and time-limited) Goals is awesome. You want your goals to be measurable otherwise how will you know when you reach them? I used to set vague goals like “I’m going to make money this month.” Ok, well, that’s great but “how much?” What is my specific goal and how will I feel when I reach it. $50? $100? Maybe $25? Write it down. Then, imagine how you will feel when you reach that goal. Excited? Inspired? Motivated? It’s important to start feeling those feelings NOW! Sounds silly? Trust me. You have to feed your body to get the results you want. You also have to feed your mind to get the desired results. TED Talks, personal development books, and podcasts are a great way to start. Maybe, you want to meet with a life coach. Find what works for you. It will take some trial and error, but if you want to develop a healthy, positive mindset, you have to FEED YOUR MIND! Now, vision boards aren’t magic. You aren’t Aladdin and Robin Williams isn’t going to pop out of a lamp and grant you everything on your board. (Although, that would be pretty incredible!) Use that board as inspiration. Look at it each day and feel those feelings. How are you going to feel when you get that new job in HR? How will you feel laying on the beach with the warm sun beaming down and your toes wiggling in the sand? Be specific! Una Margarita, por favor? It’s vital that you be flexible and give yourself grace. Change doesn’t happen overnight. You have to put in the work. Don’t beat yourself up when you stumble. Get up and try again. You are worth it. You deserve to be happy and healthy. You deserve to love yourself. Remember that any change you want to make isn’t an overnight thing. It takes work, but learning to have a growth mindset and leading a healthy life is so important! Be sure to sign up for my free 30 days to a new you email series to get tips and tricks for living your best (and healthiest) life! If you’re interested in learning more about how life coaching can completely TRANSFORM your own life, let’s set up a FREE DISCOVERY CALL!